Decks come in many types of materials, styles, and colors. As a reputed, full-service deck builder in New Jersey, we are able to provide and build with many of these options. Traditional wood decks can be constructed of durable hardwoods like Ipe (Brazilian Walnut) or Garapa Gold. Another option is sustainable bamboo. 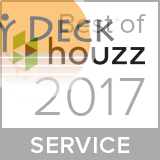 Wood decks require regular maintenance such as sanding and staining but will last a long time with care. PVC or Composite decking materials come in a wide variety of colors and patterns. They are durable, resist rot, staining, warping, and splintering with minimal care. Sweeping away leaves and debris and regular cleaning with household cleansers are all that need to be done to keep your deck looking beautiful for years. So when and how are steel deck frames better than wood? Better Aesthetics: Steel deck frames like Trex Elevation Frames are stronger and more lightweight than wood. This means that your architect will have more flexibility in post placement and can preserve more of your views. More Flexible Design: What does a more stunning deck design look like? You are probably thinking of curves and lines. If you’ve ever tried to bend wood, you will immediately understand how much more strength, flexibility, and efficiency a steel deck frames brings to your deck build. Environmentally Friendly: Steel deck frames last longer, are made from recycled materials, can be recycled themselves and, unlike pressure-treated lumber, are chemical free. Much Better Longevity: Steel deck frames will not twist and warp over time, which means your boards will not become wavy and uneven over time. They are also significantly more resilient to weather, moisture, time and pest deterioration. If you are looking for aesthetic beauty and durability for your deck, steel deck frames will not only give you superior flexibility in design but will also offer durability and strength that wood deck frames can not compete with. 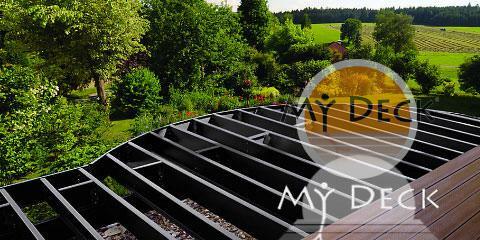 MyDeck is an award winning deck company that has been designing and building the highest quality decks since 1986. We carry the TrexPRO Platinum designation. This is the highest rating offered by Trex, one of the most reputable brands in composite deck materials and the creators of the Trex Elevations (Steel / Metal) Framing system.